The Oregon-based Benchmade Knife Co. broke new ground by using nontraditional materials and modern manufacturing methods to make their knives. Benchmade strives to produce a high-quality product every time, one that will deliver great value and superior performance for its customers. Benchmade employs premium blade steels and strong, durable handle material; patented locking mechanisms for reliability and enhanced function; and the most modern laser cutters and machining centers to achieve precision and control a cut above the rest. The Benchmade 162 Bushcrafter, measuring 9.2 inches with a blade just under 4 ½ inches long, has a high-ground drop point blade, a full-exposed tang and a durable .164-thick blade, enabling the 162 Bushcrafter to accomplish a variety of tasks. 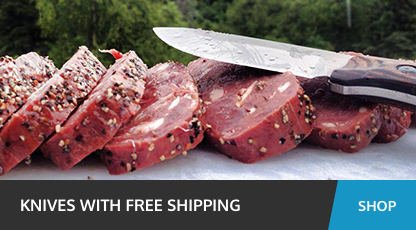 Benchmade Prestiges Steak Knives are single-piece, full-tang stainless-steel blades with hand-finished black micarta and stabilized winewood handles with hand-polished handle rivets. The blades are 4.8 inches long. 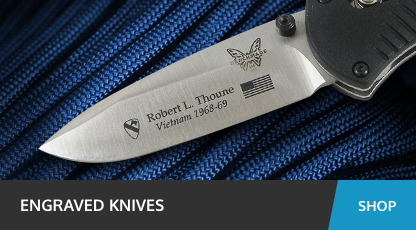 The latest knife from renowned designer Bob Lum, the Benchmade Onslaught, is a smooth, finely crafted stainless-steel blade with a modified clip point blade with an ambidextrous thumb-hole opener, black G-10 handle scales with 420J stainless liners that's 5.47 inches closed and 9.63 inches when open. Each step in the knife-making process at Benchmade is carefully calibrated to deliver a top-quality blade - from the fine-tuning of the fundamental design, to a series of methodical review and approval steps, to testing for standards more commonly associated with aerospace and precision industries to the hand assembly by Benchmade's trained team members. 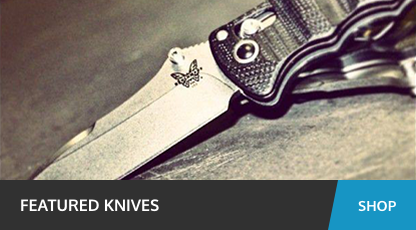 Benchmade Knives' entire line of innovative products, including the Torrent, Shoki, Subrosa, Griptilian, the Bone Collector and all the rest, can be ordered from DLT Trading Co.